Johann Gottlieb Fichte was one of those rare men who are both thinkers and heroes. His challenging Wissenschaftslehre (“doctrine of science”) remains one of the most ambitious attempts to encompass the world and its meaning in a speculative philosophical system. 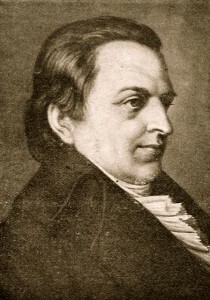 In his elaboration of Immanuel Kant’s philosophy of ethical idealism, Fichte achieved a compelling synthesis of the complementary values of freedom and duty. His conception of the world as the material projection of an ultimately all-embracing World-Ego exercised a seminal influence on the Romantic movement, that radical reassertion of Aryan racial values which in Fichte’s time was displacing the shallow rationalism of the Enlightenment. Yet it is as the hero who called for a regeneration of the German spirit in an epoch-making series of addresses in a conquered Berlin swarming with hostile French troops that Fichte will live on in the memory of his countrymen. In his Addresses to the German Nation, the philosophus teutonicus, as the patriot-poet Ernst Moritz Arndt dubbed Fichte, revealed a vision of his people’s destiny which transcends national boundaries and still beckons to our own and future generations for fulfillment. In December of 1807, it seemed that Napoleon and his all-conquering French armies had extinguished the last ember of German nationhood. In the year before, the Holy Roman Empire, the only tangible expression of the political unity of the German nation, feeble though it was, had been dissolved. More important, Fichte’s adopted homeland, Prussia, had reaped the fruits of over a decade’s timidity and indifference to the fate of its German neighbors. On October 14, 1806, at the twin battles of Jena and Auerstädt, Napoleon’s troops had all but annihilated the once matchless Prussian military machine. After fleeing to Königsberg in East Prussia, the well-meaning but irresolute Hohenzollern, King Frederick William III, had been forced to sign away half his country’s territory in the humiliating Treaty of Tilsit. Prussia was further obligated to pay a crippling indemnity, and Berlin was garrisoned by French troops. Fichte, even when he had tended to support the ideals of the French Revolution, pointedly excluded the Jews from consideration as German citizens. In anticipation of the National Socialist program, he advocated their deportation from Germany. More ominous than the military collapse of Prussia and the other German states was the concomitant decline in German morale. The purely dynastic patriotism which the various German princes had attempted to foster among their subjects had proved no match for the intense nationalism which spurred the French invaders. Although, predictably, Germany’s Jews had accorded Napoleon his most enthusiastic welcome, many a Berlin burgher had also cheered the triumphant entry of the French imperial army. Prominent citizens sought audiences with the emperor, and sycophantic writers wrote panegyrics to his genius. In pointed contrast to Napoleon’s effusive admirers, German patriots had fallen silent, content to denounce the foreign oppressors only to their most trusted friends in the privacy of their drawing rooms. There was ample justification for their timidity. French spies and German informers in their service were everywhere, and the French censors had more than blue pencils at their disposal. Little more than a year before, Johannes Palm, a Nuremberg bookseller, had been arrested in connection with the writing and circulation of an anonymous anti-French pamphlet entitled Germany in Her Deepest Humiliation. He had been betrayed to the authorities by a German policeman. On August 26, 1806, Palm had been shot in the little Austrian town of Braunau-on-the-Inn (which, 83 years later, was to acquire even greater cause for the veneration of German patriots). In these desperate circumstances, the philosopher Fichte resolved to speak out publicly in the cause of the German nation. 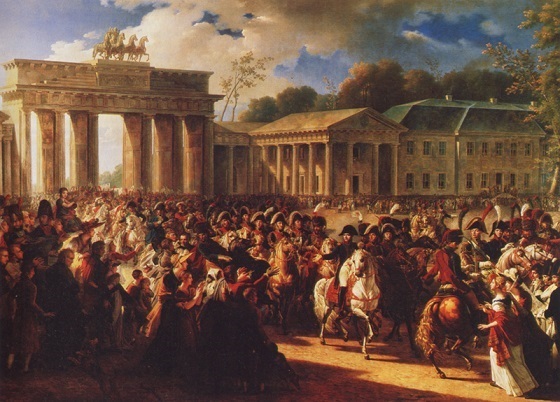 He had accompanied the Prussian court and the remnants of Prussia’s battered army to Königsberg in 1806. There, his reputation for radicalism had frustrated him in his attempts to be appointed field preacher to the troops. Disappointed but still overflowing with determination to rekindle the German spirit, Fichte returned to Berlin in August 1807. He took up residence with his family in the secluded Georgengarten, in a section of Berlin rarely frequented by the French soldiers. In the following months, he immersed himself in the writings of Machiavelli and the Swiss educator Pestalozzi, but above all in the Annalsof Tacitus, in which the heroic deeds of Hermann the Cheruscer against the Roman legions find their echo. Drawing on these writers for inspiration, Fichte began to compose a series of lectures which incorporated the spirit of Machiavelli’s and Hermann’s fervent patriotism, and drew on Pestalozzi’s concrete proposals for educational reform. Professor Fichte (who was at that time a member of the faculty of the University of Erlangen) announced the addresses in a brief notice in the Vossischer Zeitung, one of the leading Berlin newspapers of the day. According to the announcement, the lecture series was to be the continuation of a popular course Fichte had delivered in Berlin three years before, which he had titled The Characteristics of the Present Age. The Berliners who crowded the amphitheatre of the Academy of Sciences at noon on Sunday, December 13, 1807, were doubtless drawn by more than intellectual curiosity. Fichte had never shrunk from controversy, particularly in addressing the vital questions of the day, nor did he show any qualms in skewering his intellectual opponents on the sharp prongs of his scathing polemics. Would he be as forthright in dealing with the French? There was also the problem of continuity with the previous lecture series. Attentive students of Fichte could recall that in his Characteristics addresses, the philosopher had represented himself as something other than the fervent patriot he had revealed himself to be in the intervening years. In fact, Fichte had proudly boasted of a cosmopolitanism in which “we ourselves and our descendants can remain indifferent forever to the affairs and fates of nations and states.” How were these sentiments to be reconciled with Fichte’s present stance? Fichte dedicated his life not only to finding the truth but to proclaiming it to the world, regardless of the consequences. His stirring Addresses to the German Nation, delivered at the risk of arrest or even death at the hands of the French authorities, marked the dramatic high point of his public career, but his contributions to the philosophical basis of the Romantic movement were even more valuable to his posterity. Fichte stressed the importance of intuitive knowledge, that deep wisdom which lies in the race-soul and is sustained by the Universal Consciousness. From time to time as Fichte spoke, the blare of martial music reached the ears of his listeners. The broad Berlin avenue Unter den Linden ran past the Academy of Sciences, and Napoleon’s officers staged frequent parades to maintain the élan of their troops. Fichte had cleverly anticipated them. It was not his purpose to castigate the French so much as to promote a German national revival. Besides, as he pointed out, it was not at that time possible to dislodge the conquerors by merely military means. Despite his surface disavowal of anti-French aims, however, Fichte never missed an opportunity, all through the Addresses, to belabor the French and, indeed, Napoleon himself, with a characteristically French irony, which evidently eluded the French military government’s journeymen snoops. Fichte’s own life and intellectual development uniquely qualified him for his role as herald of Germany’s awakening. The philosopher’s career provides ample evidence of his own possession of those qualities of mind and will which he sought to instill in others, in sharp contrast to certain other world-betterers (Rousseau and Marx spring to mind). 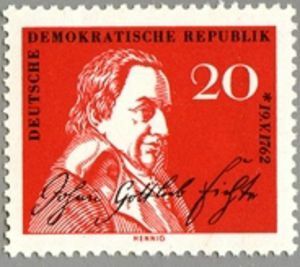 Johann Gottlieb Fichte was born on May 19, 1762, in Rammenau, Upper Lusatia, in what was then the electorate of Saxony. His origins were humble. His father was a weaver, his mother a woman of simple piety. When Fichte was nine, his quick intelligence caught the eye of a local nobleman, Baron von Miltitz, who decided to sponsor his education. After two years of instruction at a neighboring parsonage, Fichte was enrolled in the renowned Schulpforta, a private boarding school which today numbers, in addition to Fichte, the poet Klopstock, the historian Ranke, and the philosopher Nietzsche among its illustrious alumni. The education which Fichte acquired at Schulpforta qualified him for membership in Germany’s intellectual elite without estranging him from a consciousness of himself as a man of the people. When Fichte was forced to abandon his university studies after only a year, due to his patron’s death, his democratic feelings were reinforced by nearly a decade’s experience as a tutor to the sons of the noble and wealthy. Treated as little better than a servant by his wealthy employers, Fichte gained a life-long contempt for the aristocracy. The turning point in Fichte’s life came with his introduction, by a university student whom he was tutoring, to the philosophy of Immanuel Kant. Fichte immediately embraced Kant’s rejection of the shallow rationalism and materialism in vogue in German and French philosophy during the 18th century, as well as his “intuitive” justification of God and the immortality of the soul. Fichte quickly mastered Kant’s philosophy and in 1791, with Kant’s approval, anonymously published A Critique of All Revelation, which was immediately taken to be Kant’s own work. When Fichte’s authorship became known, his reputation was assured. Shortly thereafter, at the urging of Goethe, Fichte was appointed a professor of philosophy at the University of Jena in Saxe-Weimar. While at Jena, Fichte evolved his Wissenschaftslehre, in which he dispensed with Kant’s concessions to a reality capable of being objectively apprehended in favor of a world view based entirely on the supremacy of the mind and the will. Among the students he decisively influenced were the poet Novalis, the philosopher Schelling, and the Schlegel brothers, who were both to become outstanding philologists. In 1799, Fichte was forced out of Jena following a controversy worked up by his opponents around the specious charge that Fichte was an atheist. Departing the allegedly tolerant Saxe-Weimar, he found a ready reception in absolutist Prussia. In Prussia, Fichte began to develop his philosophy in a direction which took more cognizance of the importance of the nation and the state in providing the conditions under which knowledge and virtue might be attained and cultivated. In 1800 he wrote The Closed Commercial State, which sought to harmonize the exigencies of economic justice and the needs of the state. As the first description of a national socialism in other than utopian terms, The Closed Commercial State had no small influence on future political thought in Germany. By 1806 Fichte had evolved the essentials of the ideology of German nationalism which animated the Addresses to the German Nation. Despite Fichte’s situation of the Addresses in the context of his complex Wissenschaftslehre, their central thesis—that Germany’s rebirth was to be accomplished through a program of “national education”—is relatively easy to grasp. The ideas which underlie this thesis, however, require a certain amount of elucidation, especially for the modern reader. Those who approach the Addresses in anticipation of a supercharged distillate of anti-French, patriotic fustian will doubtless be disappointed. Fichte’ s purpose in delivering the Addresses was not so much to excoriate the Corsican tyrant and his French (and German) minions as to galvanize his fellow Germans into effective thought and action. Americans weaned for two generations on propaganda depicting the Germans as frenzied chauvinists will have difficulty in visualizing the degree of indifference to Germany’s political fortunes which prevailed among German intellectuals in Fichte’s time. During the previous 50 years the leading writers and thinkers of Germany had emancipated the nation’s literature and philosophy from their slavish imitation of French models. Yet, in the political sphere, the ideal of men such as Goethe and Kant remained a hazy cosmopolitanism. The special task which Fichte set himself in the writing the Addresses to the German Nation was to imbue educated Germans with a sense of national mission. To that end, he played on the feelings of cultural and linguistic pride which German intellectuals had developed over the preceding decades. Fichte argued that the German Volk was superior in character to those peoples in Europe, often originally German, who had abandoned their original languages for new ones derived from Latin. Drawing heavily on the theories of the philologist and literary critic August Wilhelm von Schlegel, Fichte differentiated between German, a “living language” or “original language” (Ursprache), able to form an intellectual and philosophical vocabulary from its own roots, and the Romance languages, which were forced to draw their scholarly words from a dead language. According to Fichte, this reliance (in the case of the German language) on native words with concrete connotations to depict the “supersensuous” insured a clarity and honesty of expression sadly lacking in such languages as French and Italian. In fact, the Germans owed their “honest diligence and earnestness in all things” solely to their language. The system of national education which Fichte proposed to insure the future survival of the German language—and, thus, of the German people—embodied a far more radical conception than is perhaps evident at first glance. The idea of inculcating in an elite a virtue which can only be acquired through knowledge goes back at least as far as Plato’s Republic. Fichte revised this idea by boldly mandating such an education for the entire youth of the nation. As is well known, Fichte’s Addresses helped fan the dying embers of German national feeling into a raging inferno which swept the French invaders from the fatherland in the Wars of Liberation five years later. Yet Fichte’s radicalism in demanding a united Germany organized along the lines spelled out in his Addresses waited a century and a quarter for its brief realization. In the short period of Germany’s resurgence under National Socialism, Fichte’s ideal of a generation of German youth steeled in character and will first began to take shape. Fichte’s courage in saying what had to be said at the risk of his own life in 1807 should serve to embolden White men and women in possession of the truth today to speak out unhesitatingly. The philosopher’s vision of a national education cutting across class lines and embracing the whole people to mold young men and women into principled members of their nation and race will remain a beacon urging us on to the future reality.